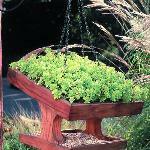 A bird feeder is an excellent project, that can easily involve the entire family. Designs are available from the simple to extremely complex. Also see our free plans for bird houses. For the home handyman who is competent in wood working building a bird feeder is not an overly complex project. Depending on the complexity of the design only basic power and hand wood working tools are required. 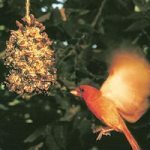 You can also purchase bird feeders in kit and finished form in both unfinished and pre-finished packages. Following are a number of designs and plans for bird feeders: We tried to choose plans and designs that had enough detailed instructions and plans that could actually be constructed. We found many additional websites that provided pictures and or drawings but the instructions and plans were almost impossible to follow or in our opinion, information was lacking. 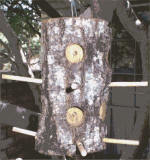 The following bird feeder plans, designs and instructions are free. 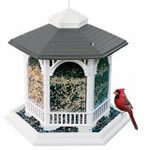 Selection of manufactured bird feeders . Log bird feeder. This is quite simple to make. The most difficult part for some may be in finding a suitable log to work with. 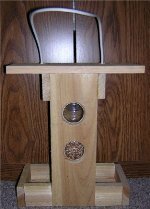 A bird feeder that makes a perfect project for teaching the next generation - woodworking skills. 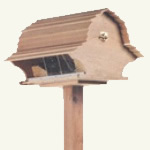 Bird feeder that has a curved roof and requires some wood working skills to cut the sides to the right angles. Flower box on top, bird feeder down below. This bird feeder is made from a pine cone. It is more of a crafting project than a woodworking project.